Hattori Hachi: The Revenge of Praying Mantis is director, screenwriter and playwright Jane Prowse’s first novel. Regular Vulpes guest Jay Benedict and Book Fox Moira had far too much fun discovering their inner adolescents (and they plainly didn’t have to look very far …). 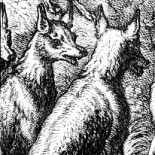 M: I loved this book from the get-go … I love any book that has you mentally shaking your head and saying “Excuse me … ? !” just eight paragraphs in. What Hattie considers ‘normal’ and what the rest of us consider ‘normal’ turn out to be two very different things and we’re plunged straight into the storyline, no messing about. I liked that. Scene-setting is all very well, but bearing in mind that this book is aimed at 10 years and upwards, the more story the faster the better. J: Me too. I loved the immediacy of it all. Already by page 2 we know most of her background, her Dad’s job (and all the travelling that involved), and by page 3, we’re into all the possibilities that windchimes open up. Nothing strange there we’re told, but to Hattie it’s a sign for her to make a quick change into a somewhat more spiritual outfit altogether and to wait on her balcony for her Mother to manifest herself, possibly in the form of a cat. The theatricality of it all; that things are not what they appear to be! Yazuki, the old Japanese lady, nearly blind and deaf, who runs the laundry on the ground floor, and who, as it turns out is not so blind and deaf after all … Actually we’re back to the Beatles’ Rocky Raccoon, you know: “Her name was Magill and she called herself Lil but everyone knew her as Nancy…”* This book is full of it! I loved it!! M: Yes – very few characters in the book are exactly who they seem to be – and we’re kept guessing about at least one of them right up to the end – and beyond … And that’s something else I liked a lot – the fact that just when you think you know who the good guys are, who the bad guys are and where it’s going – the author twists the whole thing slightly out of shape. Considering how fast the plot gallops along, she not only uses an awful lot of shades of grey, she also manages to throw in a lot of curves. How do you think boys will react to Hattie as a character – I mean I think it’s relatively uncommon to have a girl in the lead role of an action/adventure story, even now – and I’m perfectly certain there weren’t characters like her in the books I read when I was that age. I clearly remember lying in bed a night praying that I’d wake up a boy because they obviously had so much more fun than girls. J: She’s a girl for all seasons, not an Enid Blyton “Five Go Mad in Dorset” type of heroine. She’s sporty and spiritual; and inherits pet rats, Bushi and Akira, who are as enlightened as their owner! Hattie has plenty for the boys to latch onto, as she has all the hallmarks of a superhero à la Spiderman/Batman, with her box of ninja tools and tricks. She worries about her upcoming GCSEs and also how she looks on the street, but when it comes to the crunch she’s fearless. There’s been a gap in the market for a female Harry Potter/Alex Rider for a long time, but we shouldn’t forget both these series have an equal amount of female readers as male. They both have a spunky girl lead, as in Hermione Granger, and in the same way Jane gives us Mad Dog in this book. In fact I really liked Mad Dog – he’s a rebel – with a cause! Tattooed, shaven-haired and pierced, with a history of crimes and misdemeanours taking him in and out of reform school all his life. Born in prison to a violent father and a mother with a history of drug abuse, but Jane finds the soft centre inside the hardened exterior he’s built up around himself. Everything about the plot is kaleidoscopic and clues are dropped left, right and centre, before finding satisfactory resolution at another point in the book. The structure is already so filmic and each scene is easily pictured in the mind’s eye. She’s obviously written it with a movie in mind, or perhaps it’s her TV background that means she can’t fail to create visual pictures and cliffhanger moments with her words. J: Yeah, that’s what makes the book so satisfying for adults – the fact that each character goes on a spiritual journey; for better or for worse. I found reading the book an enlightening experience, with its background of Buddhist philosophy. For every Yin, there’s a Yang. The balance of good and evil is maintained, with an equal number of heroes and villains, and ordinary mortals who fall between the two. And yet the message of the book is subtle and hidden between narrow escapes and edge-of the-seat drama. The structure of the book follows the 5 Dans and ultimately good wins out without a huge Bruce Willis style body count and blood and guts spilled everywhere. When someone does die, it may be deserved, but it’s also meaningful and poignant. And yet, not all Hattie’s problems are solved. It’s obvious there’s more to come for Hattie in future adventures. And I really look forward to seeing not just how Hattie’s life progresses, but all the other characters around her: Toby, Mad Dog, Suzi, Neena, Mum, Dad, Yazuki – I even want to know what happens to the Weavers! M: Not forgetting Bushi and Akira – about whom I got quite worried at one point … And it really is refreshing to find a ‘ninja’ based adventure/action book that’s almost more interested in the philosophy than it is in the spectacular moves. It’s a book with a heart AND a brain. Book Two is already on the way of course. It would be lovely to see it turn into a long-running series, and have a generation grow up with Hattie Jackson the way one grew up with Harry Potter. Particularly as I like Mad Dog a lot more than I liked Hermione . . .
You can visit Hattie’s very own website HERE and Piccadilly Press’s Hattori Hachi page HERE. Be sure to rejoin us tomorrow, when Moira will be talking to Jane Prowse about Hattori Hachi, trying to get people to think and Disgusted of Tunbridge Wells. This … is … not … my … thing. Thisisnotmything. This is NOT my thing. But now I don’t see how I can avoid reading it. What a great selling job you have both done on it! It sounds as though the author had the most exuberant time creating this world, so readers are just bound to have a ball too. The book seems to have found a truly original world and plot in which to work through some familiar but important themes. I love the idea that there will be more, and that there might be a female hero-figure to continue to grab the imagination of readers. Do you think Mad Dog will be widely misunderstood, and turn up in the Daily Mail as a dangerous role model? He sounds great to me! My inner adolescent hasn’t come out to play very much recently (it never ever came out in my teens 😦 ) so now’s my chance! I agree with Hilary that this book has created a really original world, it has almost everything opposite of what regular sort of books have, a strong girl as hero, a delinquent friend who is really a good guy, pet rats(yay! ), Asian characters instead of caucasian, shape shifters, etc. I bet there are lots of young people who would be mesmerized by this book & any following. I hope it gets the popularity that it deserves. 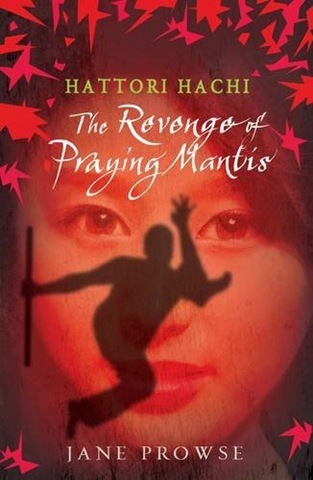 I know it’s Too Early To Be Thinking About Christmas, but I am sneaking Hattori Hachi: The Revenge of Praying Mantis into my Book Depository basket, as I know a girl who’ll love it. Thanks for the enjoyable review, Moira and Jay. it’s such a nice story. i look forward 2 ur new book! i love the ending. i like the part where hachi transformed into suzi! how cool i look foward 2 ur new book. This entry was posted on September 24, 2009 by Moira in Entries by Jay, Uncategorized and tagged Hattie Jackson, Hattori Hachi, Jane Prowse, ninja, ninjutsu, young adult.